With 2017 just kicking off, the team at KBB has decided to single out their 10 Most Awarded Cars of 2016 – the Civic, HR-V, and CR-V helped Honda make the cut three times*. No other manufacturer placed three vehicles, with only Chevy even making it to two, so there’s never been a stronger indication of the love American drivers hold for Honda nameplates. The 2016 Honda Civic sedan won more Kelley Blue Book 2016 awards in 2016 than any other vehicle; named one of their 2016 10 Coolest Cars Under $18,000, one of 16 2016 Best Family Cars, and earning the coveted 2016 Overall Best Buy Award, the Civic really outstripped everything else on the road*. Describing it as “the best compact car money can buy”, the team over at KBB marveled at the vehicle’s ability to combine Best-in-Class interior space with first-rate comfort, convenience, safety, and entertainment features, as well as mileage ratings of up to 31 mpg in the city and 42 on the highway**. The 2016 Honda HR-V was the second most-awarded vehicle of 2016, named to the 2016 Best Family Car and 2016 10 Best SUVs Under $25,000 lists*. It’s also a 2016 KBB 5-Year Cost to Own winner, and Best Buy dubbed it their Best Subcompact Crossover/SUV*. It isn’t hard to see why: the CR-V essentially unites the space of a full-sized SUV (up to 58.8 cubic feet for cargo) with the fun-to-drive nature and winning efficiency scores (up to 28 mpg in the city and 35 mpg on the highway) of a subcompact***. 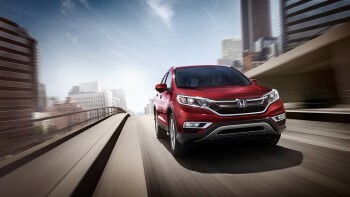 The 2016 Honda CR-V has been America’s best-selling SUV for the past 20 years****, with over 4 million models sold. KBB named it their 2016 Small SUV Best Buy*, with other awards including a Best Compact SUV rating from Car and Driver***** and a Top Small Crossover Nod from Motor Trend. The CR-V is certainly impressive, with plenty of power beneath the hood for off-road adventures and with the kind of space you need for ferrying the family between Goshen and Monroe without stress. The all-new 2017 mode has been met with critical acclaim, so we expect even more CR-V awards in the future. It takes a lot to land just one vehicle on the 2016 10 Most Awarded Cars list, so the three placements from Honda truly underline their ability to keep a step or two ahead of the competition. If you’d like to find out more about the Civic, HR-V, or CR-V, just contact Middletown Honda today. **27 city/40 highway/31 combined mpg rating for 6MT model. 31 city/41 highway/35 combined mpg rating for LX & EX CVT models. 31 city/42 highway/35 combined mpg rating for EX-T, EX-L and Touring CVT models. Based on 2016 EPA mileage ratings. Use for comparison purposes only. Your mileage will vary depending on how you drive and maintain your vehicle, driving conditions and other factors. ***25 city/34 highway/28 combined mpg rating for 6MT models. 28 city/35 highway/31 combined mpg rating for 2WD CVT models. 27 city/32 highway/29 combined mpg rating for AWD CVT models. Based on 2016 EPA mileage ratings. Use for comparison purposes only. Your mileage will vary depending on how you drive and maintain your vehicle, driving conditions and other factors. ****Based on IHS Automotive, Polk CYTD December 2015 Non-Luxury Compact CUV Segment new retail registrations in the US.